Argan oil (also called Argon Oil, Argane Oil) is pressed from the nuts (or kernels, like a peach pit) of the Argan tree. The Argan tree (Argania spinosa) is well adapted to the drought conditions of southwest Morocco. The Argan tree has a deep root system which helps protect against soil erosion. The tree is also very thorny and the trunks are gnarled. Argan trees grow up to 10 meters tall can live up to 200 years. The Argan tree's habitat once covered most of North Africa, but is now listed as endangered. Over the past 100 years, the area the Argan tree grows in has declined by 50%. Goats love to eat the fruit of the Argan tree. 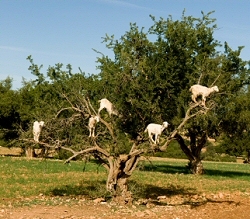 Goats actually climb up into the Argan tree to get to the fruit despite the tree's thorns! The fruit is relatively small, about 2 to 4 cm long and 1.5 to 3 cm across. Inside the fruit is a nut, or pit, surround by a bitter peel and sweet smelling, yet unpleasant tasting, fleshy fruit. The nut looks something like a cross between a walnut and an almond. The argan fruit is gathered up and the nuts are removed from the fleshy fruit. The fruit is later used as animal feed. The nuts are roast over an open fire - much like chestnuts - giving the argan oil its distinctive nutty peppery flavor. If the argan oil is meant for cosmetic use, the nuts are not roasted. 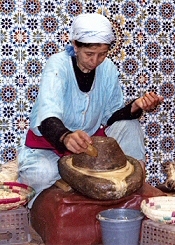 Once the nuts are roasted, Berber women crack the nuts open with sharp stones. The kernels are then ground by hand into a paste. The paste is then squeezed by hand to extract the oil from the ground kernels. The leftover paste is used to create a funnel and the argan oil is poured through the paste funnel into bottles. The paste is then sent to factories where more oil can be extracted. Hand pressed argan oil has a shelf life of roughly 3 to 6 months whereas commercially pressed argan oil has a shelf life of 1 to 2 years. It takes the fruit from one tree, about 14.5 pounds, to make one liter of argan oil. Argan oil is used as a dressing on salads, on meat and fish dishes. Amlou, a spread for bread similar to tahini or peanut butter, is made with argan oil and almonds and sweetened with honey. Argan oil produced for cosmetic use is very rich in Vitamin E and essential fatty acids including linoleic acid, and Omega 6. Argan oil is said to help conditions such as dry skin, acne, psoriasis, eczema, and wrinkles. Argan oil is used on skin, hair, and nails. Argan Oil for culinary and cosmetic purposes can be found at Amazon.com .